The Mountain Goats driving force John Darnielle has forged a critically acclaimed song-writing career on his ability to convey the emotions of society’s outsiders. 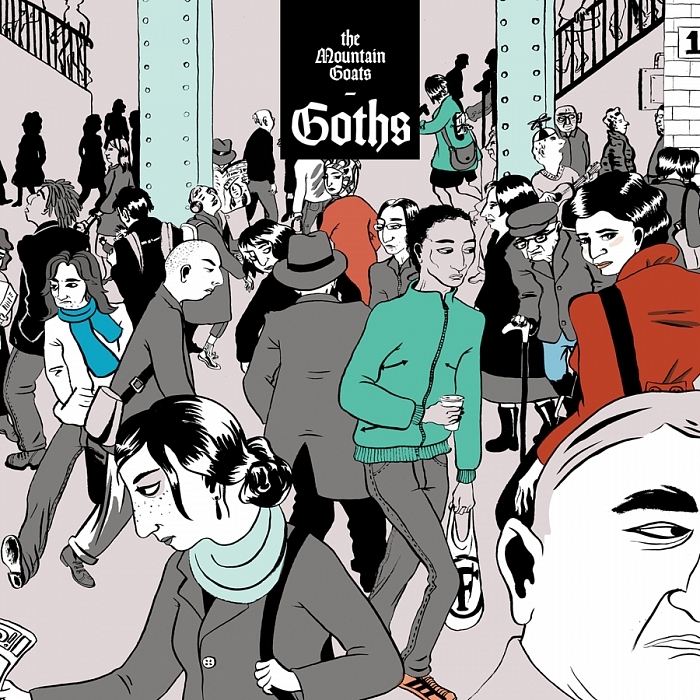 As a result there is an inevitability about Goths getting The Mountain Goats treatment. From the addicts on All Eternals Deck (2011) and We Shall All Be Healed (2004), to the small town wrestlers on last year’s Beat the Champ, Darnielle is a story teller who perfectly encapsulates the tragedies and triumphs of life. This even extends to himself, as a music loving teen escaping into alcohol from an abusive homelife, on The Sunset Tree (2005). He has also introduced us to characters like Jeff and Cyrus, the tragic young bandmates of All Hail West Texas (2002)’s The Best Ever Death Metal Band Out Of Denton. To some extent Goths is the continuation of Jeff and Cyrus’ story, of teens finding identity through music. Except here they have grown up and are looking back at their younger selves through older eyes. Second track Andre Eldritch is Moving Back to Leeds encapsulates this. Here the protagonist is drawn back to his past after moving from this provincial goth hot spot in Yorkshire to London and back again. Other older and former goths question their youthful obsession with darkness and death. Unicorn Tolerance is particularly good at conveying the soft vulnerability underneath those who look odd, morbid and even dangerous to those around them. The narratives move across the world, from the UK, Berlin, Portugal to the US, which is the main focus We Do It Differently on the West Coast, where an older goth still closely follows the scene. Goth performers are also featured. There’s a jaded former singer lamenting the changing music industry and his fading star on Shelved. Here he wistfully remembers riding the stage hydraulics and being tethered to a cross with the sad knowledge that such excitement is behind him. As with All Eternals Deck there are also tales of real life celebrities, such as on Abandoned Flesh where Gene Loves Jezebel’s footnote in music history is the focus. In terms of musical arrangement the Mountain Goats are on top form here. Many of the tracks having a lounge, jazz feel, where the older current and former goths are cast as piano singers reminiscing about the good old days. The use of woodwind, arranged and played by Matt Douglas throughout and a Fender Rhodes keyboard rather than guitar, help too as does the drumming of Jon Wurster. Bassist Peter Hughes is also a highlight across the album. He even gets to do a traditional goth bass solo on Shelved. One of the best is opener Rain in Soho, where drama is added by a 16-strong contingent from the Nashville Symphony choir who dropped by from a nearby Mahler rehearsal in Nashville, where this album was recorded. As with all Darnielle’s subject matter he offers an understanding and poignant interpretation of their highs and lows. This album is particularly effective as Hughes points out, because they themselves are older, former goths. “While John writes the songs, as he always has, it feels more than ever like he’s speaking for all of us in the band, erstwhile goths (raises hand) or otherwise,” says Hughes.